Ox is the second sign of the Chinese horoscope. The Ox is Yin and is fixed to the Water element. The characteristics of the Ox correspond to the occidental sign of Capricorn. Yin is negative, feminine, and associated with the Night. 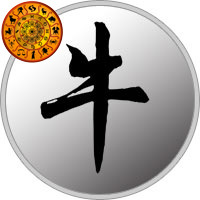 Subjective Yin signs trust their feelings about themselves and others. You tend to be more concerned with the spiritual than the physical. As all opposites attract in nature, Yin attracts Yang. The Water element association bestows a better than average ability to communicate and an awareness of the feelings of others. There are 12 Primal Zodiac signs for the Eastern Zodiac sign of Ox, one for each sign of the Western Zodiac.